223 Roanoke Drive, Kill Devil Hills, NC.| MLS# 103601 | Outer Banks Homes For Sale, North Carolina Home Search Including Nags Head, Pirates Cove, Manteo, Kill Devil Hills Kitty Hawk, Southern Shores, Duck, and Corolla North Carolina, Oceanfront and Soundfront properties for sale and long term rentals. CUSTOM BUILT CANAL FRONT HOME!!! PRIME WATERFRONT LOCATION!!! Spectacular expansive views! 50 feet deep water canal frontage! Boater's delight! 4 Bedroom, 4 1/2 bath, PLUS den/office and rec room/game room plus 2 workshops & ELEVATOR SHAFT IN PLACE! Absolutely gorgeous home- features granite kitchen counter tops & master bath vanity, ceramic tile in all bathrooms and rec room, tile master shower, professionally designed kitchen w/full extension drawers, solid oak flooring in living and hallways, elevator shaft, built-in book shelves & cozy gas fire place! 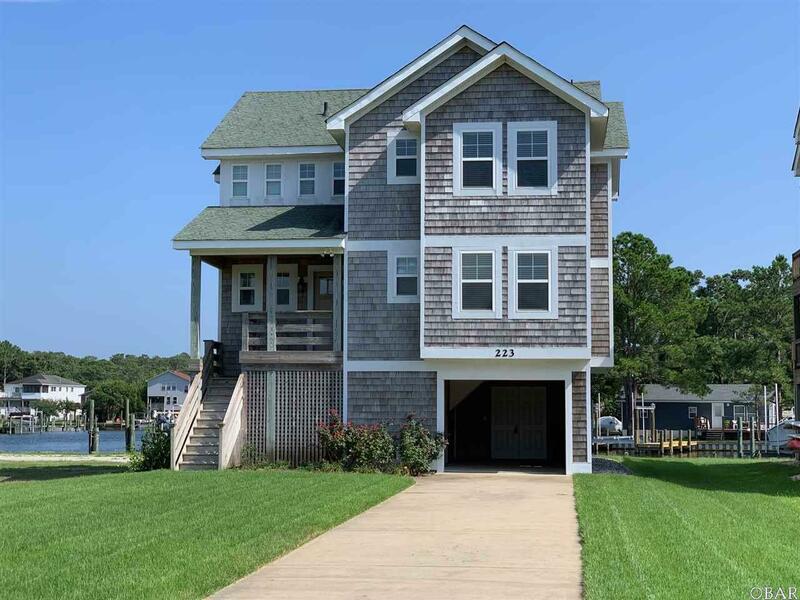 Multi-level waterside decks all with lovely water views! Roughed in: central vacuum system, Johns Bros security system, Le Bleu water system for sink/refrig, surround sound, outdoor shower, much more... Irrigation system w/lush centipede turf grass. This is a must see!!!! Show today! !